We all know the most obvious places where we can find sugar...cakes, cookies, doughnuts, ice cream (is your mouth watering like mine?). 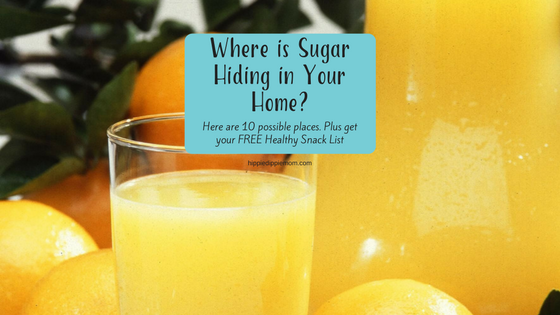 What can be surprising are all of the places where sugar is hiding. Don't get me wrong, I know how bad sugar for me; however, I am human!! I'm a human with a huge sweet tooth!! Part of what keeps me able to walk away from sugar is knowing what it's doing to my insides. This article talks about how researchers and nutritionists hid how bad sugar is from us. In a nutshell, sugar is the root cause of most disease as we know it today! High blood pressure is caused by sugar. High cholesterol caused by sugar. Chronic pain can be caused by sugar. Sugar isn't 100% the cause of disease, but I've heard several functional medicine doctors give the statistic that 95% of disease shouldn't exist; yet it exists because of what we're doing to ourselves! Eliminating the following foods from your diet or making better choices will significantly decrease your daily sugar intake!! Oh and FYI - the RDA (recommended daily amount) of sugar for adult man is 36g, an adult woman is 25g and for kids is 11g (less for younger kids). In my recent trips to the grocery store, I've been checking out the nutrition labels on yogurt. In one of the most popular brands, the regular yogurt has 18g of sugar (plus modified corn starch); the 'light' yogurt has 10g of sugar!! A yogurt made specifically for kids has 8g of sugar, carageenan and 'natural flavor' (yuck!). Even 'healthy' fruit yogurt from grass fed cows has 15g of sugar. Your best bet with yogurt is to get PLAIN yogurt from grass fed cows, and add a handful of organic berries and grain free granola to it! It doesn't matter how 'healthy' a juice is. When juice is extracted from fruit, it's sugar! Yes there are really really bad juices out there (ie juice that contains artificial flavor/color), and there are better choices for juice; however, eating vegetables and fruit whole is always the best choice. Just to put this into perspective - 12 ounces of Coca-Cola has 40g of sugar, 12 ounces of 'no sugar added' organic apple juice has 39g of sugar and 12 ounces unsweetened grape juice has 58.5g of sugar!!! Dried fruit is high in sugar because the water has been removed from the fruit. When fresh fruit is dried the water is removed which means that the sugar and fiber becomes concentrated. It also means that it's easier to eat more! For example, 1 regular size box of raisins contains about 90 raisins. Raisins are dried grapes. Would you eat 90 grapes in one sitting? 1 regular size box of raising has 25g of sugar! Cranberries are another popular dried fruit. I used to put them in salads, trail mix and on my oatmeal. Then, I learned that 1/2 cup of dried cranberries contains 37g of sugar!! Here's a grid that compares dried fruit, fresh fruit and candy. One tablespoon of your average ketchup has 4g of sugar. That doesn't seem like much, but do you measure your ketchup before you put it on your fries? I didn't think so :) That means you're most likely using 2-3 tablespoons (8-12g of sugar). BBQ sauce has always been my favorite condiment; BBQ sauce has 5.7g of sugar in one tablespoon. I KNOW I was using way more than one tablespoon at a time! One sauce I was shocked to find has sugar in it is enchilada sauce! Why does enchilada sauce need sugar?! Again, I was shocked to discover that broth (beef, chicken and vegetable) contains sugar! My favorite brand of broth that doesn't contain sugar is Imagine. So coffee itself doesn't contain sugar, but a lot of people dress their coffee up with sugar. One of my favorite espresso drinks used to be the 'White Chocolate Mocha' from Starbucks. Even if I skipped the whip cream, that drink contains 51g of sugar!!!! I have nothing against coffee! I drink it daily, and I don't drink it black BUT I make it way healthier than I used to. I start with organic coffee beans, throw in some unsweetened almond milk and then some monk fruit sweetener which is a zero glycemic sweetener. Ok so yes honey is natural. And yes it has some medicinal properties, but according to Sarah Wilson at I Quit Sugar, only 2% of honey is medicinal....the rest is sugar! Typical honey is 16g of sugar per tablespoon! A lot of people tend to eat more honey than they really should because they think "It's not bad for me, it's natural!". 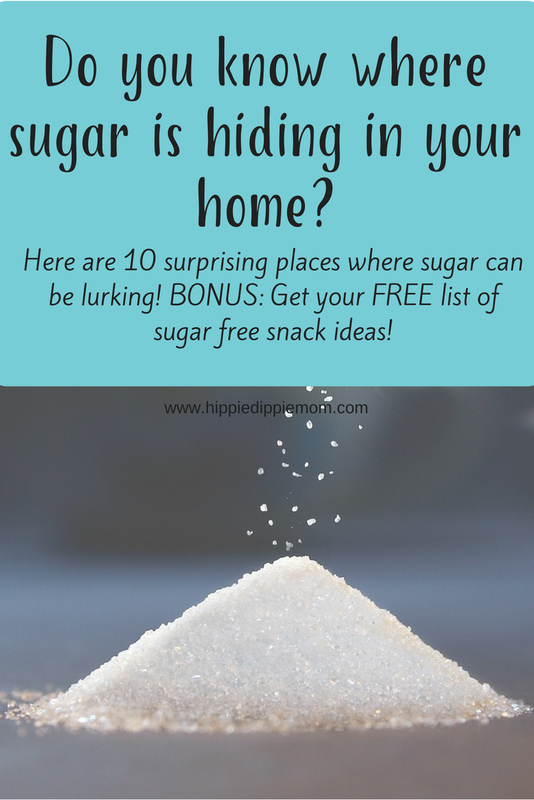 If you look up sugar free recipes on Pinterest or Google, you'll often find recipes that contain honey or maple syrup (53g of sugar p/tablespoon). Honey is a better option that refined sugar or artificial sweetener, but in serious moderation! Some alternatives are monk fruit extract and brown rice syrup. Some energy or protein bars have 20+ grams of sugar! No wonder why it gives us energy! There is also usually a ton of artificial flavors, colors and all kinds of icky chemicals lurking in these bars as well. And don't let the packaging that says things like 'Non-GMO' or 'Paleo' or 'No Soy' fool you!!! Read the ingredients and sugar content! Having a healthy salad? What dressing are you putting on it? Check the nutrition label and you'll probably be surprised at how much sugar is in each serving. Typically, a serving size of salad dressing is 2 tablespoons. I have never measured my salad dressing which means I probably always use more than 2 tablespoonfuls. Regular salad dressing can have 5-7g of sugar per serving and 'low-fat' or 'non-fat' salad dressing tends to have more sugar than regular dressing. Either use olive oil, salt and pepper on your salad or pick a healthy dressing like this one. One pint of reduced fat milk contains 13g of sugar!!! Milk contains lactose. Any word ending in -ose is a sugar. Homogenized and pasteurized milk kills the enzyme, lactase, that our bodies require to digest milk. If you feel the need to drink cows milk, purchase raw milk from grass fed cows, and use it sparingly. Goats milk is a better option because it's easier for our body to digest and it has less lactose than cow's milk. The best option would be to make your own nut milk. It's super easy!! 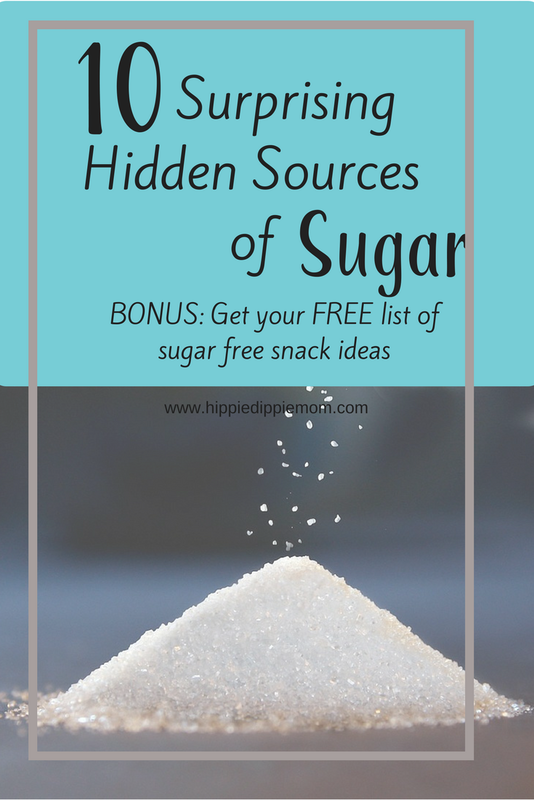 Were you as surprised as I was with these hidden sources of sugar?! Are you ready to kick sugar to the curb? Sharing is caring! Pin your favorite image below! Join me on Social Media to stay up to date on events, challenges and all things healthy!! How to Safely & Effectively Use Essential Oils. The information on this website is not intended to diagnose, treat, cure or prevent any disease.